It was over 102 on the air field in Wilmington but the cars were fast the bikes soom'in by all in all a great day. The Vintage Wheels Car Show in Richmond Indiana June 9th 2012 was a blast, located downtown in the historic section of town it had great shade local food on the cheap, music but not too much a good selection of cars truck and a few bikes all in all not a bad show we will be back. Ray Slone was born and raised in Dayton OH. He was in his Dad’s body shop from a very young age. He started working as a body man by the age of 13. By 16 he was fulltime and had earned enough money to buy a car. His first car was a 1972 VW Bug and he loved it. But his favorite car in high school was a 1976 camaro, after that he was a car guy for life. At the same time Ray was developing a love of photography and art. By his late 20’s he had become interested in print and marketing. Moving in to this field with E-Rider Graphics art photography and large format printing company in 1999 with a target market with Cruiser’s in mind. Working on many Entertainment & car related projects we met with many TV, Radio, and Entertainment People who helped us decide to start the TV show. Now in our sixth year on FOX, ABC we have had Carrol Shelby of mustang fame. Truett Cathy (C.E.O. of Chick-fil-A), Bo Hopkins and Candy Clark of American Graffiti. Drag strips like National Trails Race Way. Big shows like Good Guys, A.C.D, in Auburn IN. And Kruse International Auctions, Trans AM Nationals, and Entertainment like DR. Hook and John Kay & Steppenwolf , Fog Hat ,Foreigner, Starship and more. 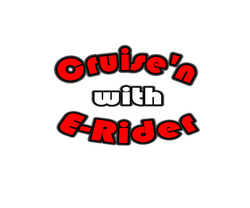 Each week Cruise’n with E-Rider can be seen by all most a quarter million viewers on the My Network on Dayton’s on digital 995 and 45.2 also seen on MVCC chl 23 and DATV chl 20. Bruce Clarke was born and raised in Dayton, OH. His first car show was The Hershey Antique Classic Car Show and Swap Meet in Hershey, Pennsylvania. His Step Grandfather Larry Clifford took him to the show. Larry was showing a 1910 Ford Model T with a 1917 motor with the new thing an electric start, and various assorted T Parts. Bruce’s first car, was a 1976 Grand Prix .The Pontiac was a hand me down from his brother. Bruce is an A.S.E., Mechanic, for 12 years. And like his father he loves to build cars. Bruce has a new car he is working on now a 69 convertible Grand Prix that we hope to see this year at the shows. Ray started E rider graphics to provide quality pictures for people who love their cars. Ray asked Bruce if he would like to help, he agreed and E rider was born in 1999. In 2001 they decided to produce a TV show about cars and the entertainment in the tri state area.